Enterokinase (EK) is an enzyme produced by cells of the duodenum and involved in human digestion. It plays a role of turning trypsinogen to its active form trypsin, and indirectly activates the pancreatic digestive enzymes. Enterokinase is a specific protease that cleaves after a lysine preceded by four aspartic acids: Asp-Asp-Asp-Asp-Lys. Enterokinase will not work if the recognition site is followed by a proline. 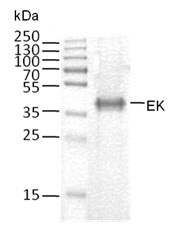 Recombinant Bovine Enterokinase (rbEK) as the light chain is a single glycosylated polypeptide chain containing 200 amino acids. A fully biologically active molecule, rbEK has a molecular mass of 27 kDa. 20mM Tris-HCl, 200mM NaCl, 2mM CaCl2, 50%Glycerol, pH7.2. Stable up to 1 year at -20°C from date of receipt. Please avoid freeze-thaw cycles. Molecular Weight: Theoretical MW: 27 kDa. Apparent MW: 40.0 kDa, observed by reducing SDS-PAGE. One unit is defined as the amount of enzyme needed to cleave 50 μg of fusion protein in 16 hours to 95% completion at 22°C in a buffer containing 25mM Tris-HCl, pH 8.0. 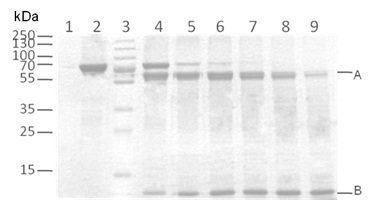 Figure1 Lane1: 10U EK; Lane2: Fusion protein; Lane3: Marker; Lane4: fusion protein+0.2U EK; Lane5: fusion protein+0.4U EK Lane6: fusion protein+1U EK; Lane7: fusion protein+2U EK; Lane 8: fusion protein+4U EK; Lane9: fusion protein+10U EK. 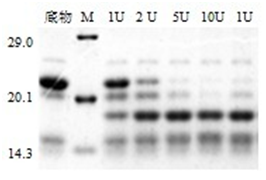 Mw of Fusion protein:72KD; Mw of A:59kDa; Mw of B: 13kDa. Figure 2 and 3 shows activity of EK of competitors.